Peter Westbrook was born April 16, 1952 in St. Louis, Missouri to Ulysses and Mariko Westbrook, who moved the Newark shortly after their son’s birth. The couple had met in Japan when Ulysses was stationed there during the Korean War. A sister, Vivian, followed. The Westbrooks split up when Peter was four, leaving Mariko to fend for herself. Her children were taunted in school because of their mixed race, and Peter became a good fighter. Fearing her son’s temper and taste for battle would land him jail (or worse), Mariko steered him toward fencing. As a student tt Essex High School, Peter came under the tutelage of Dr. Samuel D'ambola, who started Peter off with a military sword, the saber. Peter’s childhood hero was Zorro, who used the same weapon to carve Z's in his enemies. Long practices kept Peter off the streets, and by the time he graduated, he was one of the best fencers in the country. Peter attended NYU on a fencing scholarship. There he worked with coaches Hugo and James Castello, and also with Csaba Elthes at the New York Fencers Club. Elthes was the top fencing coach in the nation. In 1973, Peter won the NCAA championship as a junior. 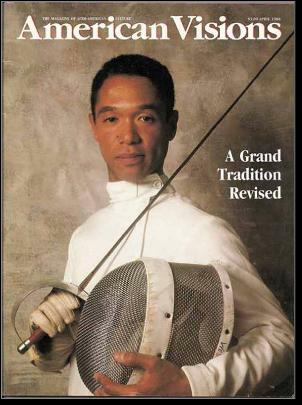 In his senior year, he won the national championship, held by the Amateur Fencers League of America. He would go on to win this title a dozen more times in the next 20 years. Peter set his sights on an Olympic medal in 1976, but a practice injury kept him off the medal stand. The U.S. boycotted the Summer Games in 1980, so Peter’s next shot came in 1984. He took home a bronze medal. He returned to Olympic competition in 1988, 1992 and 1996. In 1992, he was granted the honor of being Team USA’s flag bearer at the opening ceremonies in Barcelona by a vote of his fellow athletes. During the 1980s, Peter launched the Peter Westrbrook Foundation to introduce inner city children to the sport of fencing. Twenty-five years later more than 400 children participate in the program annually, and several of his students have gone on to win national titles and represent America in the Olympics.